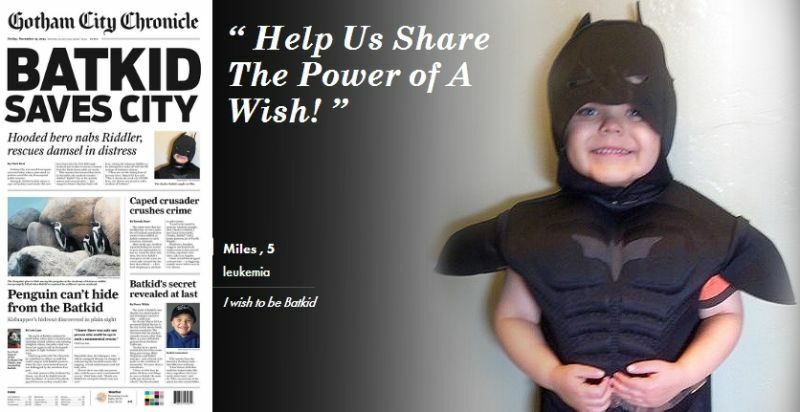 Thousands of Bay Area residents have signed up to help fulfill a five-year-old cancer patient's wish of becoming Batkid for a day. When the Make-a-Wish Foundation fired up the Bat-Signal in the hopes of getting members of the public involved in making Miles Scott's wish of seeing San Francisco transformed into Gotham City come true, they expected a few to respond. But the organization, which rarely seeks assistance from volunteers, saw support pour in, with some 12,000 offering to be part of Miles' special day. One resident even donated a Lamborghini, which was converted into a Batmobile to drive Miles to the scene the crime. 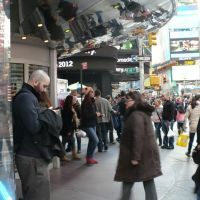 "I've never seen anything go viral like this, with the outpouring of support from across the world," said Patricia Wilson, executive director of the local Make-A-Wish Foundation chapter. According to an agenda released by the nonprofit, Miles' will be called on to don his Batkid cape and cowl after being alerted through a breaking news story that Commissioner Gordon (played by San Francisco Police Chief Greg Suhr) needs help "bringing the bad guys to justice." Miles will then make his way to the Hyde Street cable car line to rescue a damsel in distress, followed by a quick trip to a downtown bank where he will catch the Riddler in the act of robbing a vault. From there, Miles will head to the Burger Bar for lunch, but his crimefighting duties won't be on hold for long. The chief will be sending him an alert calling his attention to Union Square, where the public volunteers will gather to cry for help. Miles will then be informed that the Penguin has kidnapped the city's beloved SF Giants mascot, and BatKid is the only one who can save him. The plan is to wrap up all the heroics by 2 p.m. local time, when Miles — that is, BatKid — will be handed the key to the city by the mayor himself. The San Francisco Chronicle will be getting in on the action as well by releasing a special edition of its newspaper — rechristened Gotham City Chronicle — with the headline "Batkid Saves City" splashed above an article by mild-mannered reporter Clark Kent. You can follow Miles' Big Adventure using the hashtag #SFBatkid, as well as through the Make-A-Wish Bay Area Twitter account, which will be posting photos of the event, and hopefully, a video of the whole thing later today. Perhaps the most heartwarming part of this story is the news that Miles, who has been battling acute lymphoblastic leukemia since he was barely two, is currently in remission, and his last chemotherapy session was back in June. dooope RT "@HPGoodNews: Go, Batkid! RT @pilarwish: Ready for action! #sfbatkid pic.twitter.com/aU0fHRToVp"
Update 3:00 p.m.: Here are two more amazing photos from Batkid's big day — one of which was shared by President Obama's account. ABC7 has a livestream for those who want to follow Batkid from above as he fights for justice around "Gotham." Update 5:00 p.m.: Hooray! Batkid has saved Giants mascot Lou Seal from the clutches of the evil Penguin and is now off to receive the key to the city from Mayor Edwin Lee. Update 5:30 p.m.: The Justice Department has formally indicted both the Riddler and the Penguin after they were apprehended by Batkid earlier today. Watch the Boy Crusader get the keys to city live with NBC Bay Area's live feed. 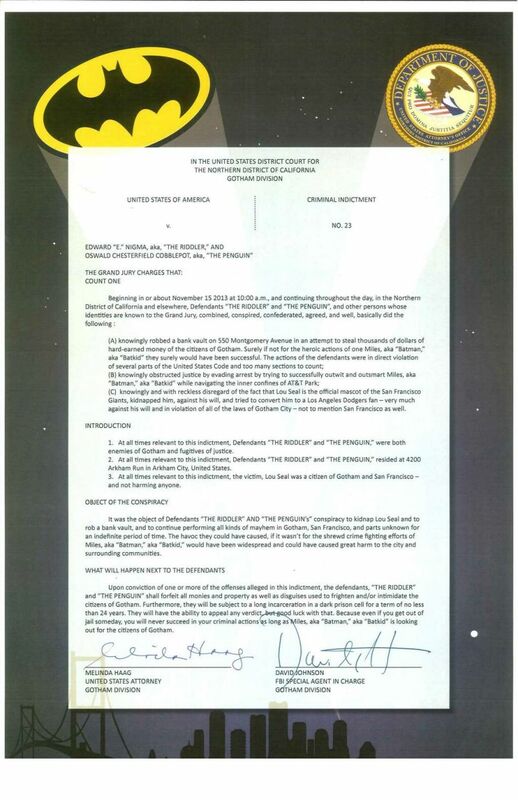 Update 5:50 p.m.: As Batkid's wish winds down, the city ensures that his heroism won't soon be forgotten by declaring November 15th "Batkid Day" forever.